In a small bowl, combine paprika, cinnamon, and salt; set aside. Rub tenderloins with olive oil and sprinkle with spice rub. Grill pork, turning as needed, until lightly charred and meat thermometer inserted in thickest part registers 135 degrees (approx. 9 minutes). When pork is grilling, place peach quarters on grill for approx. 2 minutes per side, until lightly charred. During the last few minutes of grilling, brush pork with peach glaze to finish. Allow pork to rest 5–10 minutes before slicing. 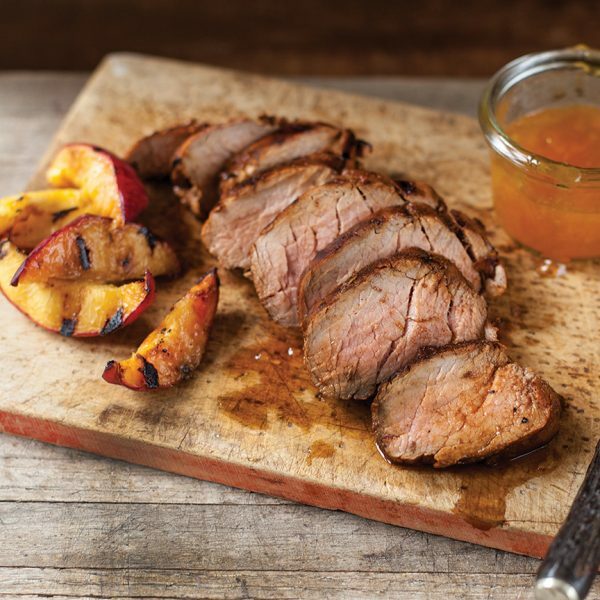 Serve with grilled peaches.